Casan Scott continues his guest series on evaluating NFL prospects through Principal Component Analysis. By day, Casan is a PhD candidate researching aquatic eco-toxicology at Baylor University. Jadeveon Clowney is thought of as a “once-in-a-decade” or even “once-in-a-generation” pass rushing talent by many. Once the top rated high school talent in the country, Clowney has retained that distinction through 3 years in college football’s most dominant conference. Super-talents like Clowney have traditionally been gambled on in the NFL draft with little idea of what future production is actually statistically anticipated. For all of the concerns over his work ethic, dedication, and professionalism, Clowney’s athleticism and potential have never been called into question. But is his athleticism actually that rare? And is his talent worth gambling millions of dollars and the 1st overall pick on? This article aims to objectify exactly how rare Jadeveon Clowney’s athleticism is in a historical sense. 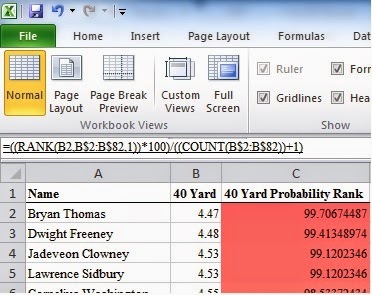 Probability Ranking allows me to identify the probability of encountering an athlete’s measurable. For instance, I probability ranked NFL combine 40 yard dash times for 341 defensive ends from 1999-2014 (Table 1 shows the top 50). In this case, Jadeveon Clowney’s 40 time of 4.53 had a probability rank of 99.12, meaning his speed is in the 99th percentile of all DEs over this time span. To attempt to quantify how uncommon Jadeveon Clowney’s overall athleticism is, I probability ranked the most impressive individual drills and overall workouts of 82 defensive end prospects over the past decade. These 82 defensive ends were selected based on availability of quality data for their complete NFL combine workout. This group of 82 was used in a previous article of mine (http://www.advancedfootballanalytics.com/2014/04/draft-prospect-evaluation-using.html#more) and will be used for future analyses to come. I applied a Weibull ranking* of all 82 players’ 40-time, bench press, vertical leap, broad jump, shuttle run, and 3-cone drill. *I used the equation P = 100 × i/(n + 1) to rank combine drill performance, where i is the rank number of the data point, n is the total number of data points in the set, and P is the probability rank of that value, i. This is actually pretty impressive company. Among the players ranked ahead of Clowney, JJ Watt is one year removed from NFL Defensive POY, while Margus Hunt is a world class track-and-field athlete. Of the players ranked below Clowney, Chandler Jones is a member of possibly the most athletic family in sports (see Jon and Arthur Jones) and Robert Quinn led the NFC in sacks last year. For those interested, here is the general format and Excel formula for performing Weibull Probability Ranking. Feel free to contact me at Casan_Scott@Baylor.edu or casanscott@gmail.com for any comments, questions, or advice. I’d love to share any methods, coding, etc. to anyone interested. Where is the cognitive speed data, such as the Wonderlic? Athleticism is overrated in the NFL. I will bet on a fast thinker much quicker than a fast runner. Brady turned in the second worst QB time in the 40, since 1999. You know Tom Brady, the greatest draft pick in history, chosen late in the 6th round. The NFL has chosen some of the greatest athletes in history but has missed some of the greatest players. Is it possible to incorporate the results from the Harvard analysis on the combine measureables that are statistically significant in this position group? According to this article, the only combine measureables that are statistically significant for DEs are the 40-yard dash, 3 cone drill, and weight. Ideally, these measureables should be given more weight in this analysis. Thanks for your interest! I agree that the wonderlic is a valuable measurement. However, here I sought to use the same data set I've been using for PCA and Quantile Regression to illustrate the utility of these tools. I do like that study's approach! However I wasn't trying to predict anything using only combine numbers, but rather sought a way to quantify a combine performance within a historical context. My other article on Quantile Regression used combine numbers and NCAA stats as predictors and did a better job than that of the Harvard Study's (quite a bit higher r2). Having said that, these tools are best used in a exploratory way rather than predictive, as they help us dissect trends from confusing data. Thanks again for your interest! 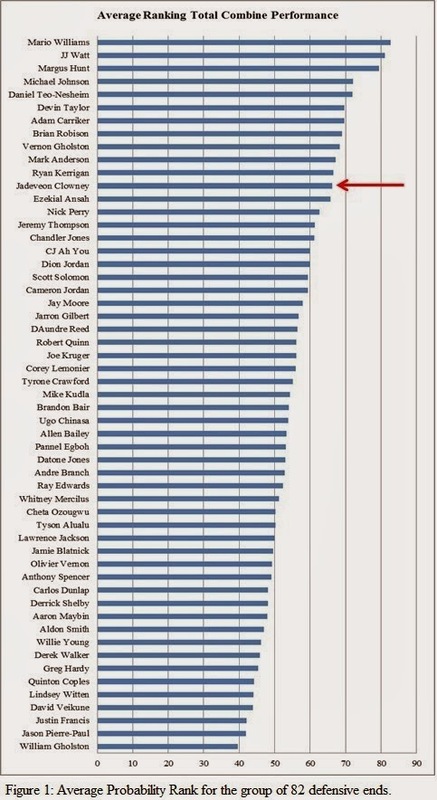 No one has ever found a positive relationship between Wonderlic scores and player performance. So while coaches may want players who have high "football IQs", testing their math and reading skills seems valueless. Also, I'd suggest that averaging percentile scores may not be the best method. Guys with high scores in certain areas and low scores in others may be more valuable than guys with mediocre scores across the board. For example, Clowney and Ansah bring elite speed with low strength, so in the right scheme they can succeed as pass rushers and one gap run defenders. "My other article on Quantile Regression used combine numbers and NCAA stats as predictors and did a better job than that of the Harvard Study's (quite a bit higher r2)." Thanks for responding. Could you show me where I can find this article (apologies if it is obvious and I'm missing it)? Nevermind, looks like it is obvious, I look forward to reading it. Completely agree Nathan. Weighting is needed. There actually has been a slight correlation demonstrated between Wonderlick and player performance, but not the one the poster above you is implying. There is actually a negative correlation between player performance and Wonderlick for DBs and TEs. That's right Bill- Wonderlick is completely meaningless at most positions, but you'd do better to pick a DB or TE with a lower Wonderlick score than an equivalent guy with a higher score. "Also, I'd suggest that averaging percentile scores may not be the best method. Guys with high scores in certain areas and low scores in others may be more valuable than guys with mediocre scores across the board. For example, Clowney and Ansah bring elite speed with low strength, so in the right scheme they can succeed as pass rushers and one gap run defenders." Common wisdom, however imperfectly or inconsistently applied; better that he do one or two things well, than that he do everything okay. Why? Because you can scheme around a player's imperfections, but you can never make soup from rocks. As a Lions fan, the presence, on this list, of five of their guys struck me: Lo Jack, Willie Young, Ziggy, Devin Taylor, and Larry Webster. I find my initial faith in Mayhew confirmed: know what you want and stick to it, until foul circumstance proves the need to change something. I find myself curious as to how well the modification of their Wide-9 scheme, from two open ends to open/closed, will accommodate existing personnel. Now, I've got to examine their metrics with an eye to this dichotomy. Do you have reason to believe these stats aren't normally distributed? Not attacking the methodology. Just wondering.